Chocolates. Ah. The word brings so much comfort and pain at the same time. Like most things, the mind knows what it has been taught and chocolates are no different. The first time my patient told me that she was on an overdose of chocolates because she read that it was great for health, my response was, "What chocolates are you eating?" Foreign chocolates are an aspiration and those who travel will tell you that the same brand of chocolate tastes different abroad. In this scenario, India is fighting back with home grown bean-to-bar chocolates and handmade chocolates are slowly catching the fancy of those who want more than sugary, milky, vegetable fat laden chocolates. Amidst this, an Indian brand decided to take things on in a bigger way. A much bigger way. Factory made chocolates, but treating every chocolate bean the way it is meant to be treated. 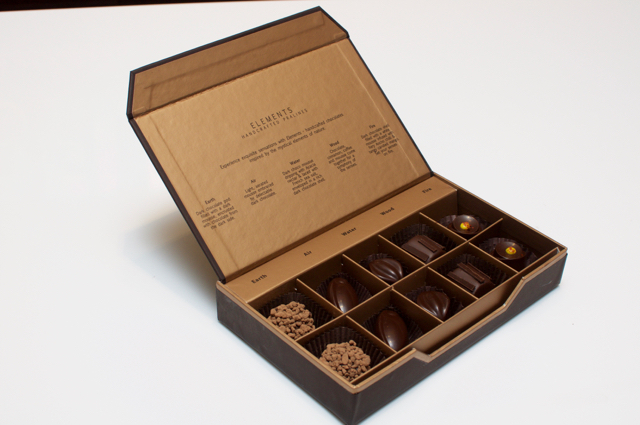 Curated by chocolatiers. Some big names from around the world. From cocoa beans from around the world. 'What's Indian in this? ', you may ask. Let us put some perspective to our "foreign chocolates." Most of the cocoa is grown in the equatorial region. The best chocolates are supposed to be from Europe. The Swiss, the Belgian and the likes. Europe is very far from the Equator, isn't it? Now, the Europeans found out that when cocoa beans are transported with their husk on, they retain their properties for a very long time. So while they are made in Europe, the beans come from Africa and South America! Now those beans are coming to India! At Fabelle! With factory made chocolates, for the most of us who are non-connoisseurs, it is very difficult to appreciate the quality of chocolates and comparisons are difficult. The Elements, which is a beautiful range, for example. With Acacia nectar representing water, a beautiful chilli representing fire and cinnamon representing wood, these chocolates are made to be among the best factory made in India. Again, very difficult for us to appreciate. How would you know if the chocolate is 72% Venezuelan vs a 68% Dominican? Difficult, right? 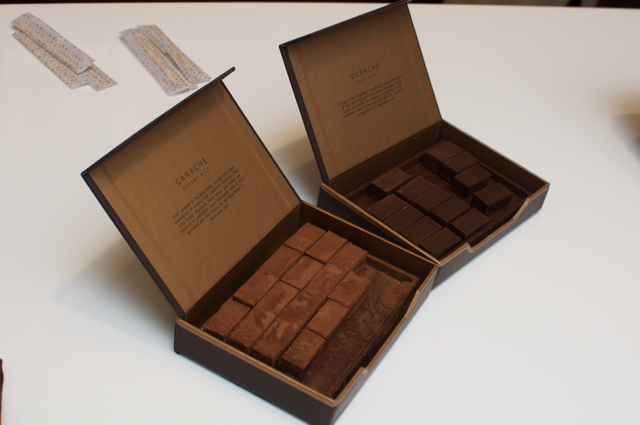 Will it matter to you if your hot chocolate was made with hand made chocolates? But ITC has chefs! Some amazing ones! At ITC Grand Chola, the food has taken a upward jump over the last 2-3 years. And these guys can play with ingredients. Give them some amazing ones and they can create magic! 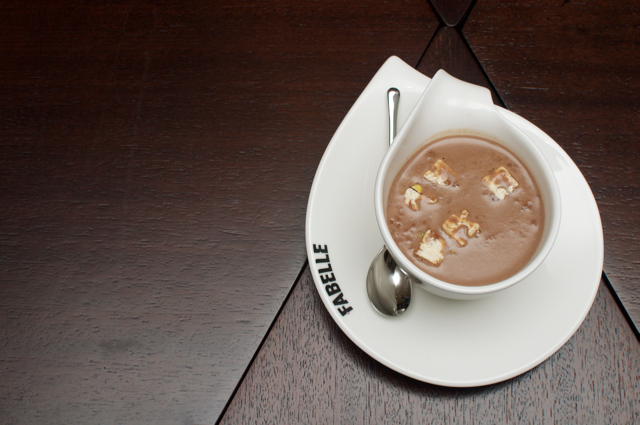 And this is where Fabelle clearly stands out from the Godivas and the Lindts of the world. The creations. Take some amazing chocolate which is difficult for us to appreciate and create something that makes us look up and say, "Hey, I like that." 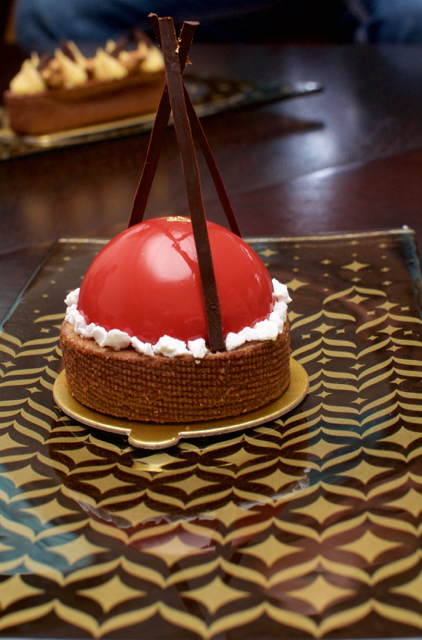 For example the almond and coriander tart. Yes, coriander. The one with the red dome in the photo. The almond was the accent here and the coriander stood out. Not overpowering, but not just kissing your throat either. It is all over your tongue without overpowering your palette. This for me, is where Fabelle will stand out in it's quest for global appeal. 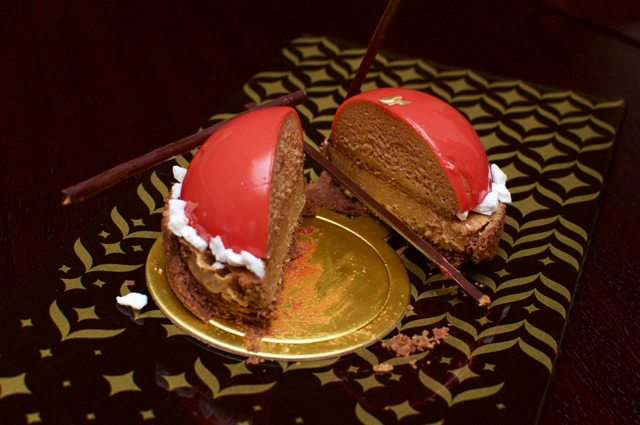 Not just great chocolates, but great things to do with those great chocolates. And if you want Masterchef type dessert, look no further. Flowers open on your table and other smart things happen! The price? Rs. 575 all inclusive for most of the plated dessert, Rs. 400 for five pieces of Elements and Rs. 675 ai for about 20 pieces of some amazing Dark Chocolate Ganache that is so melt in your mouth. Oh and if you buy the ganache, Fabelle is not taking any chances with the temperature, so they will pack with an ice pack good enough to keep the ganache in place for a few hours of Chennai heat! 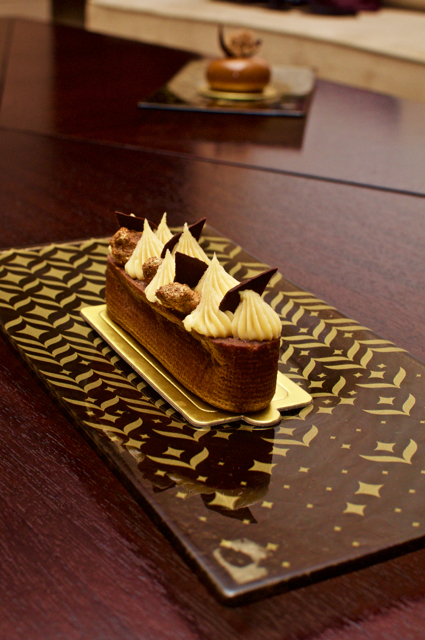 Chennai now has beautiful exclusively chocolate dessert bar! Yay! 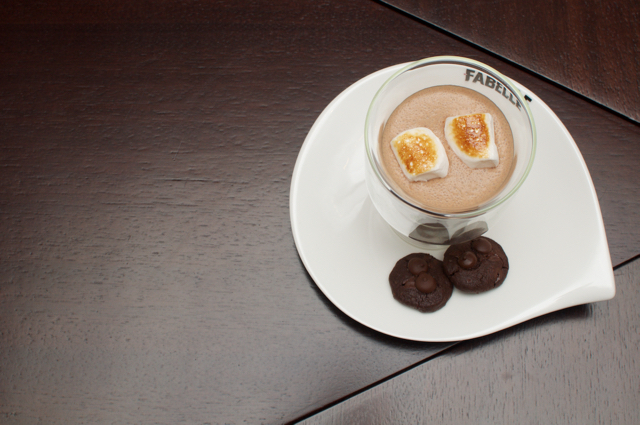 Fabelle Chocolates is now open at ITC Grand Chola and soon will be present in luxury malls too!